Helen Rule lives in Marietta. She holds a degree in anthropology from The Johns Hopkins University of Baltimore and an MBA from Emory University in Atlanta. Her jewelry, armor and origami designs reflect her extensive background in cultural anthropology and archaeology, as well as her passion for East Asian art, history and culture, and her lifelong interest in military history. Chainmaille refers to the material produced by linking small metal rings together to form a mesh. Helen has been studying and making chainmaille for over ten years. 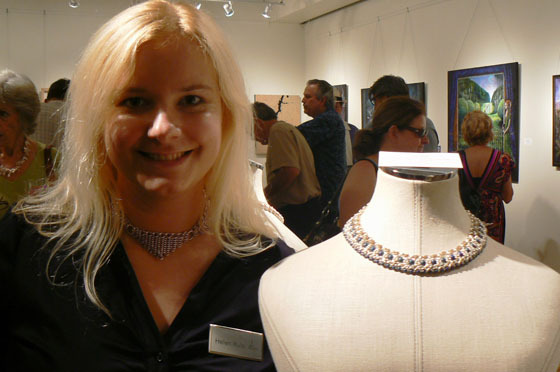 Her chainmaille jewelry pieces have hundreds (sometimes thousands) of hand-made links that are woven into unique works of art. Because of the many types of chain patterns that can be produced and her ability to incorporate other elements (such as semiprecious stones, beads, found objects, etc. ), Helen's chainmaille jewelry pieces are complex, beautiful, and unique. Her designs range from the casual to the exquisite. Helen also designs wearable pieces of clothing and armor that incorporate chainmaille, leather, metals and cloth. She draws much of her inspiration from the techniques used in ancient military garb. Helen's armor pieces are influenced by the traditional shapes and techniques of ancient armor used around the world, but incorporate her own unique designs and materials. Also drawing upon her interest in Asian culture, Helen creates unique origami ornaments, sculptures, and jewelry, primarily revolving around the iconic crane so prevalent in Japanese society. Origami is the traditional Japanese art of paper folding. It is believed to have started in the 17th century AD and was popularized outside of Japan in the mid-1900s. It has evolved into a modern art form. Helen's origami pieces range from simple ornaments to elaborate sculptures incorporating found objects and other elements, even including chainmaille in some pieces. I have always been intrigued by military arms and armor, not only because of the utilitarian purposes, but also because of the innovative design, precision metalworking and skillful assembly. I am fascinated by the inherent beauty of even the most basic and utilitarian of designs, not to mention such pieces as the elaborate and highly detailed Samurai swords and armor that are works of art in themselves. Chainmaille was originally developed over 2500 years ago as personal armor for soldiers, and was employed across Europe, Asia, and North Africa until recent times. Today, its main uses are as jewelry and for protective gear such as shark suits. I taught myself how to make traditional European 4-in-1 chainmaille armor in college, and it has spiraled out of control from there. When I started making jewelry, it was only natural for me to find my home in chainmaille, however my designs quickly began to take on a style and character completely unique from what is commonly found in the chainmaille jewelry world. I am constantly challenging myself to create new pieces that appeal to a universal audience, not just those who seek out chainmaille. Creating chainmaille is an exceedingly difficult and time-consuming process, and I add to that difficulty by making all of my own jump rings. I use a variety of wire in my designs, including the more traditional brass, copper, and silver to the more unusual like bronze, niobium, and titanium. While the Byzantine weave is my favorite due to its versatility, I also commonly use Persian, Japanese, and European patterns and their variants.